Hi friends! Thanks for stopping in. 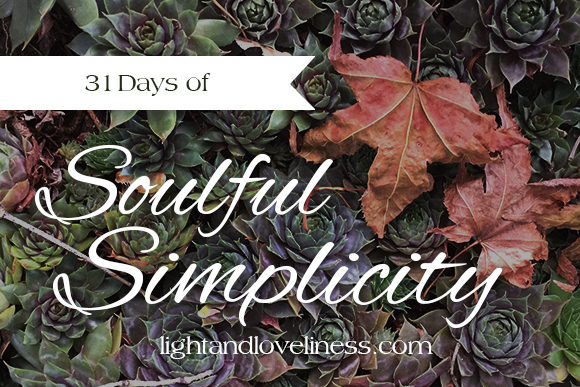 I am delighted to introduce my 2016 Write31Days challenge on the topic of Soulful Simplicity. I hope you’ll dive in and find some practical ideas on how to thoughtfully improve your life through the pursuit of simplicity in your heart and home. My goal is to share something each day for the month of October. If you’re interested in checking out more Write31Days topics from other bloggers, go take a look around at what other bloggers are writing on this month. If you have any questions for me, or would just like to connect, feel free to send me an email ( lightandloveliness [at] gmail [dot] com) or find me on Instagram (@emily_sue_allen). Have a lovely day! 2 – What is Soulful Simplicity?